There are all sorts of problems that can prevent your door from working optimally. The great majority of them can be very dangerous, so it's important that you don't try to undertake these malfunctions on your own. If you find yourself in need of assistance, there's no one better to turn to than our professional technicians. Your motor unit can experience a whole slew of mechanical issues, from worn out gears to a broken trolley and other issues with the drive system. But it can also suffer from electrical problems that may cause it to not work at all. If it's a matter of replacing a fried circuit board or fixing some of the wiring, our team will be the right team to call. We can take care of all the potential issues your opener may experience. Although most people think the opener is what bears most of the door's weight, the springs are actually the ones that do that. They counterbalance the panels and assist the motor unit (or you, if it's a manual door) to lift and lower the door safely and smoothly. Unfortunately, the constant stress these components are under will eventually cause them to break. While their lifespan can be extended with proper maintenance, they can still end up breaking unexpectedly due to a variety of issues. Broken spring replacement can be very dangerous, so we recommend that you give us a call when this happens to avoid possibly getting seriously hurt by these components. Garage door track repair is another aspect we specialize in. Over time, the parts that guide the movement of the rollers can pick up dents, or become bent and misaligned. This can cause all sorts of issues, including forcing a couple of rollers to pop out, which will cause the door to get off track and become stuck. Our experts will quickly repair the problem by straightening the tracks and reinserting the rollers into their proper place. We'll then make sure the door can once again move smoothly and silently. If you need urgent assistance, or you want to schedule an appointment to say time that better suits your schedule, our team is the right one to call. 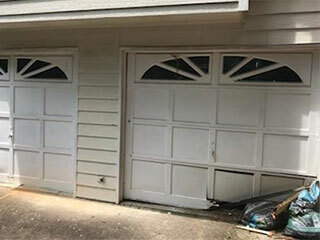 Contact Garage Door Repair Friendswood today to get the help you need, when you need it.